THE WEEKLY WRIGHT-UP: NO WAY TO OPERATE? Sometime in 1975 word circulated that officials the NY State Department of Health had toured the Darwin D. Martin House in order to assess its suitability as a half-way house for mental patients. A meeting was called by interested preservationists that caused Robert Ketter, President of the SUNY Buffalo (owner the house), to declare it the university's Canadian-American Center. 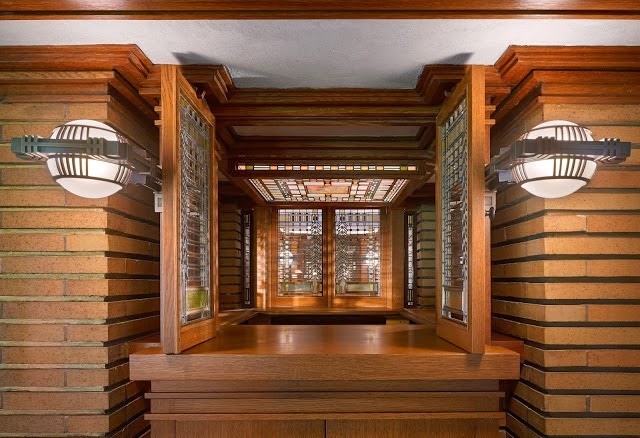 He also appointed Lorelei Z. Ketter, his wife, and me as co-chairs of a committee, the Friends of the Darwin Martin House, to raise restoration funds. Neither of us knew much about the business of raising funds but we barged ahead, created a tour of Wright buildings in Buffalo, and raised a total of about $8,000 in a few years. With some of these funds we had the sagging eaves of the east porch reinforced. 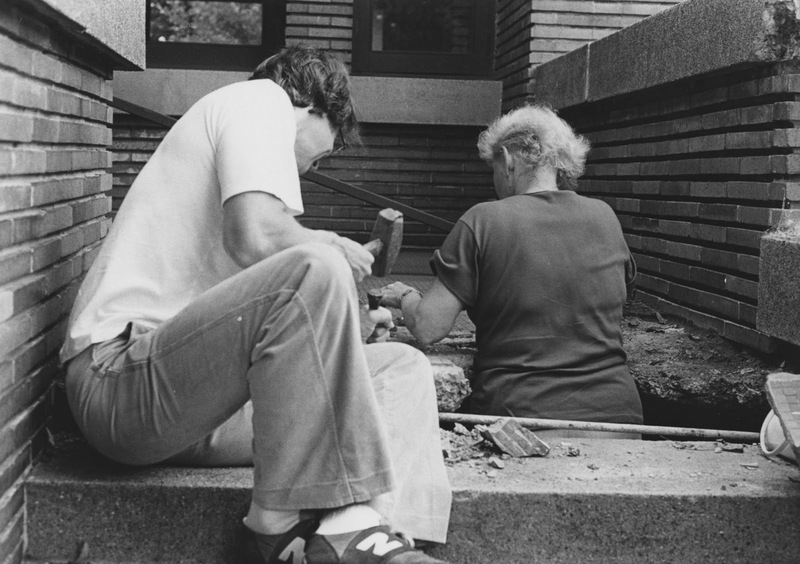 Then the tile-topped concrete slab of the entrance porch collapsed because the reinforcing metal mesh was too near the bottom face of the slab. As the photograph shows we were very "hands on" as co-chairs. But no, contrary to popular myth, we didn't use bake sales. 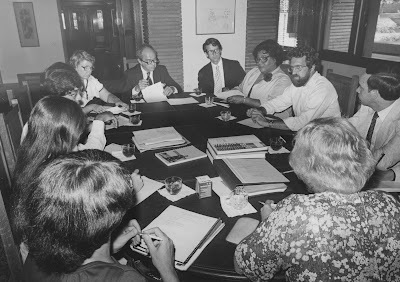 The second image represents our board: counterclockwise from the lower right are Lolly Ketter (blond; back to camera), Steven Dunnett (now UB Vice Provost for International Education), a UB Engineer (whose name I've forgotten), George Unger (Office of the President, EOC Director), Jack Quinan (UB Assistant Professor), Edgar Tafel (architect and former Frank Lloyd Wright apprentice), Margaret Foster (granddaughter of Darwin Martin), and three unidentified student and community members. Our efforts were rather short-lived as Robert Ketter stepped down as president of the university in 1981 and was succeeded by Steven Sample who promptly turned responsibility for the Martin House over to the Dean of the School of Architecture and Planning where it languished for the next twenty years. This is not to castigate those deans because, as we used to say, the university was not in the business of historic preservation. However, under William Greiner, who became the university president in 1991, the Martin House Restoration Corporation was formed and the present restoration campaign got underway. But that's another story, a triumphant one. Jack there are 10 people in the pic. You identify everyone except the woman sitting between you and George Unger. Who is this mysterious woman? Oh! I had no idea. Thanks for clearing that up! I'm trying to find out information about Wright's construction details and found your blog through an internet search of images. Could you please tell me, are the exposed base and cap shown in the top picture cut stone or cast concrete?